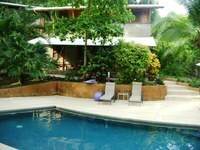 Casa “Mas Mañanas” is built on a cliff overlooking the beautiful Pacific Coast of Costa Rica. It is located inside the Tango Mar resort community with access to the amenities of the resort: a boutique hotel with great restaurant and bar, spa services, horseback riding on the beach, 9 hole golf course, tennis etc. Tango Mar has security 24/7, but the location of Casa Mas Mañanas is so private that you feel you are in the middle of the jungle. With no neighbors visible on either side, you simply hear the waves of the Pacific crashing on the beach in front of you. 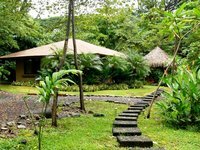 Numerous bird species, howler and white faced monkeys, and a jungle creek that runs along the back of the house enhance the serene and tropical feel. Palacio Tropical is a magnificent, three-story ocean front estate featuring seven luxurious bedroom suites, a fabulous gourmet kitchen, an entertainment room, private nanny or pilot quarters, private sun bathing decks and party patios on each level, an outdoor pool with a natural waterfall, cocktail bar and built-in gourmet barbecue, a pristine, private beach ... and a full time palace staff just waiting to treat you like royalty! Enjoy the 180 degree, panoramic views of the Pacific while sitting comfortably on your private balcony. Surround yourself in luxury. The newly constructed property has all the modern conveniences. Each of the two homes has incredible vaulted ceilings and unique architecture that allows an incredible amount of light in. Air conditioning and ceiling fans cool both houses on hot days. This exclusive and exquisitely designed home is one of a kind in this region. Designed to take advantage of the year round breezes this open air home has all of the amenities and upscale custom finishings one could hope for in a vacation residence. Not only is Casa Yin Yang one of the most luxurious homes in the entire area, but it boasts a view of the surf break like no other. From almost any point in the house you can look directly into the waves, and are only steps away from the white sand beach and warm tropical water. Enjoy the amazing panoramic views of the Cabo Blanco Reserve, the famous surfing beaches of Mal País and Santa Teresa, all the way north to Samara from the ample terrace where all the best surf breaks can be seen as well. Completely furnished and equipped with all the accessories a house should have and more from all the basic electrical appliances until a BBQ into a very nice Gazebo located by the Spa and the spectacular infinite pool where you experience the sensation of being just a step away from the ocean. The house is surrounded by a beautiful garden and sleeps up to 4 people in 2 bedrooms with 2 queen size beds in each room with 2 huge bathrooms inside the house plus a pool side full bath, a big living and dinning room and a very nice kitchen. "Casa Grande". 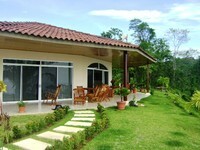 Very Comfortable House for Rent in Mal País. This modernist style architecture boasts vaulted ceilings, handcrafted doors and elegant wood detailing. 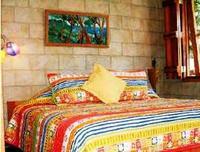 Its privacy and quietness turns this villa into the perfect vacation destiny for up to 4 people. 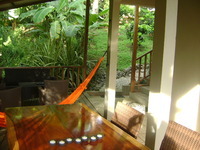 Costa Rica real estate at its best! A spacious Studio with private bathrooms and hot running water, Air Conditioning, Telephone, High Speed Internet and an equipped kitchenette where you can enjoy amazing ocean views! This one bedroom apartment comfortably sleeps up to 2 people and counts with daily housekeeping service and your own Private Security safe. All towns’ amenities and a great surf spot available at just a 5 minute walk away! Beautiful Fully Eqquiped Vacation Villa "Casa Romantica"
Casa Romantica`s privacy and beauty is the perfect vacation destination for those who appreciate a real relaxing environment in the heart of the famous white sand and surfing beaches of Mal País and Santa Teresa. This cozy Villa sleeps up to 5 people and is fully equipped with two private master bedrooms with private bathroom and A/C, telephone, high speed internet, private security safe. Screened Windows, daily housekeeping service. An open concept living room/dinning room and a modern chef's kitchen together with two sofa bed upstairs which tops out this amazing house and an outdoor private terrace overlooking lush beautiful gardens. At just a short walk to the beach, this 2 floor home features 2 bedrooms with 2 queen size beds in each room, one full bath and complete kitchen combined with the dining area, Ceiling Fan and a beautiful spacious terrace with a very nice garden view. This property is situated very private yet in the heart of Playa El Carmen in the center of the famous surfing beaches Mal País and Santa Teresa. This beautiful home includes also High Speed Internet, Daily housekeeping service, 24/7 Security, Massage Therapist and a Private Chef upon request. 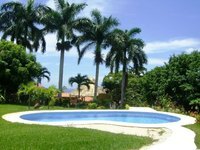 Los Delfines Golf and Country Club is a residential community in located in Playa Tambor on the southern part of the Nicoya Peninsula. The area is really beautiful and unspoiled. You can do tours such as horseback riding, ATV tours, fishing, snorkeling at a beautiful tropical Island, and visiting the white sand beaches of Montezuma, Mal Pais & Santa Teresa where you can find good surfing, nice bars & restaurants. Enjoy fabulous views of the beach, palm trees and the ocean in this unique tropical setting. 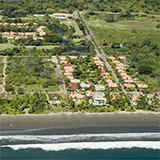 Costa Rica real estate homes for sale.